Local photographer, Lynn Shupp of Photography by Lynn has donated a $200 gift certificate to Family Promise. The gift certificate is good toward a sitting fee, ordering prints or purchasing Lynn’s amazing photography. All of the proceeds from the raffle will benefit Family Promise of Carbon County. Lynn is celebrating 20 years in business with an , 1300 Fireline Rd in Palmerton on Saturday July 29th from 4pm – 7pm. Community members are encouraged to drop by for the sip and shop with special giveaways, and artisan jewelry, upcycled items, cards, prints and handmade purses. 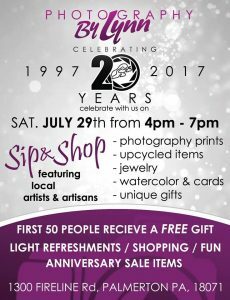 Raffle tickets for the $200 gift certificate will be sold during the Sip and Shop event on July 29th. Call the Family Promise office at 610-379-4757 if want to purchase a raffle ticket but cannot attend the event. Raffle tickets are $5 or 3 tickets for $10. This is a great opportunity for Seniors from the Class of 2018 to support the homeless shelter for a chance to win a gift certificate for Senior photos!